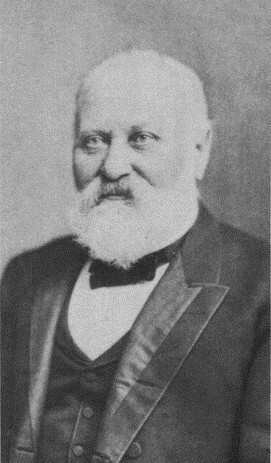 Claus Spreckels (1828–1908) was perhaps the most successful German-American immigrant entrepreneur of the late-nineteenth century; he was one of the ten richest Americans of his time. The career of the “sugar king” of California, Hawaiʻi and the American West consisted of building and breaking monopolies in sugar, transport, gas, electricity, real estate, newspapers, banks and breweries. The first industry in which Spreckels succeeded was quite typical for German immigrants: beer brewing. In the spring of 1857, together with his brother Peter Spreckels and Claus Mangels, among others, he founded the Albany Brewery, the first large-scale producer of beer in San Francisco. Though profitable, he sold his beer operation in 1863 and switched to a new field that would make him rich: sugar. That year, he started the Bay Sugar Refining Company, but sold it three years later. In 1878, through his friendship with King Kalākaua, Claus Spreckels secured a lease of 40,000-acres of land on Maui and by 1882 he acquired the fee simple title to the Wailuku ahupuaʻa. That same year, Spreckels founded the Hawaiian Commercial Company, which quickly became the largest and best-equipped sugar plantation in the islands. The Spreckelsville Mill was actually four mills in one complex (it was located just to the northeast of the present Kahului Airport, near the intersection of Old Stable Road and Hana Highway.) The town of Spreckelsville built up around it. Part of the production innovation was the use of electric lights; the first recorded onshore use of electric lighting in Hawaiʻi was at Mill Number One of the Spreckelsville Plantation on Maui on Aug. 21, 1881. To satisfy the curiosity of people anxious to see the “concentrated daylight,” Capt. Coit Hobron ran a special train from Kahului, and King Kalākaua, Widow Queen Emma and Princess Ruth were among those who came to view the lights. Sugar is a thirsty crop and Spreckels built the Haiku Ditch that spanned thirty miles and delivered fifty million gallons of water daily, irrigating twenty times as much land as had previously been irrigated. Looking to upgrade from the mule and oxen means of moving sugar to the mill (as well as reduce costs,) Spreckels built a narrow-gauge railroad to haul the sugar from the plantation to the mill. By 1881, twenty miles of iron track were completed. The rail line also transported the processed sugar to Maui’s major port, Kahului. By 1885, Spreckelsville had forty-three miles of railroad, four engines and 498 cars for hauling cane. Needing transportation to move his Hawaiʻi sugar for refining on the continent, he formed JD Spreckels & Bros. shipping line in 1879, which was incorporated as the Oceanic Steamship Company in 1881. It was the first line to offer regular service between Honolulu and San Francisco, and his sons managed to reduce travel time immensely. While the sailing ship Claus Spreckels made a record run of less than ten days in 1879, by 1883 the new steam vessel Mariposa needed less than six days. Spreckelsville was the largest sugar estate in the world by 1892. The late-1890s saw internal family conflicts. Spreckels lost control of HC&S and in 1898; it became a part of Alexander & Baldwin Co. Following the 1948 merger of HC&S and Maui Agriculture Co., HC&S became a division of Alexander & Baldwin. Hawaiʻi served as only one of the venues for the Spreckels holdings. During the 1880s and early 1890s, he bought and built up several blocks of office buildings in San Francisco. I have added other images related to Claus Spreckels in a folder of like name in the Photos section on my Facebook and Google+ pages.